Aprilia V90 four-stroke longitudinal 90° V-twin engine, liquid cooled, double overhead camshaft with mixed gear/chain timing system, four valves per cylinder. ∅43 mm Sachs upside-down front fork with fully adjustable compression and rebound damping and spring preload. Wheel travel 167 mm. Sachs hydraulic shock absorber with adjustable rebound and preload. Wheel travel 150 mm. Front: Dual 320 ∅mm stainless steel floating discs. Brembo four-piston radial callipers. Metal braided brake hoses. Rear: 240 ∅mm stainless steel disc. Single piston Brembo calliper. Metal braided brake hose. Continental two channel ABS system and Aprilia Traction Control (ATC). Front: 3.50 X 17" Rear: 6.00 x 17"
If it is a true 24 liter tank. 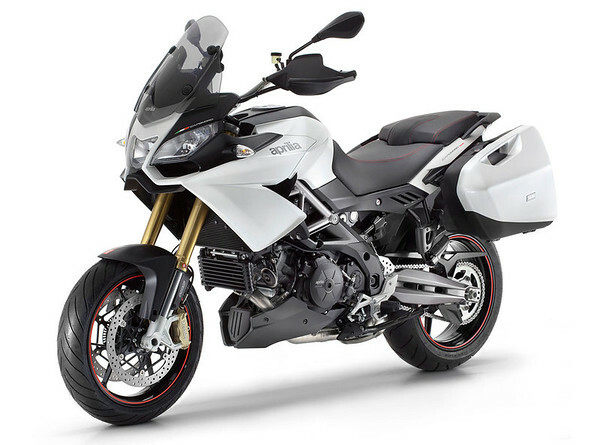 I may have found my next tourer since no sight of a Falco/Futura replacement. This is it. Multi tooled Adventure Sport bike that will replace the two F's and the ETV1000 that i had.